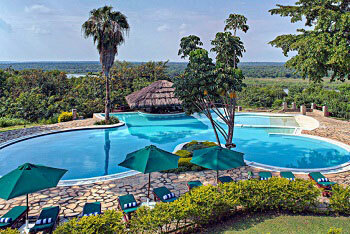 Our 3 Days Queen Elizabeth Wildlife and Chimpanzee Safari in Uganda, One of Uganda’s most popular parks. Famous for it’s beautiful kazinga channel home to abundance of wildlife, assortment of crater lakes, forested Gorges and Savannah plains. The tour will also take you to Kyambura gorge for spectacular chimpanzee trekking. 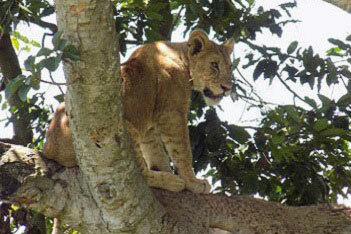 Come with us for an exciting wildlife adventure and memorable holiday to Uganda. The 3 Days Queen Elizabeth Wildlife and Chimpanzee Safari Uganda starts with an early morning breakfast then a pick up by your driver/guide ready to transfer you to Queen Elizabeth National Park for an afternoon Chimpanzee Safaris Uganda and during this Chimpanzee trekking in Kyambura gorge, you may spot other primates like Vervet, black and white colobus monkeys, the boldest of all are the baboons be sure to keep your car windows closed to avoid food theft. You will also be able to see some of the many birds found in the forest. Later check in at Either Mweya safari lodge or Kasenyi safari Camp (Luxury option) or Park view lodge or Enganzi game lodge Bush lodge and Ihamba safari lodge (Midrange lodges) or Lazy Camping at Bush lodge for (Budget option). Meal plan Lunch and dinner. Day 2: Queen Elizabeth Morning game drive and afternoon Kazinga channel boat cruise. Our 3 Days Queen Elizabeth Wildlife and Chimpanzee Safari in Uganda starts with an early morning cup of hot coffee as we get ready for an early game drive that welcomes us to a classic African safari experience as we track through Kasenyi area the North of kazinga plains in search for astonishing Hippos, African Elephants, African Buffalos thriving in it’s grasslands and shorelines. 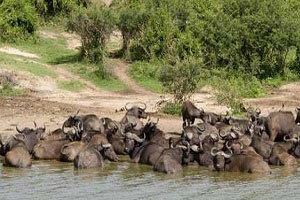 During the game drive we guarantee you sighting of some Africa’s most iconic species. Other common herbivores include Warthogs, Waterbucks, Uganda Kob and Topi as well as the Sitatunga antelope. With an experienced guide, the early morning game drive is the most successful way to track down a pride of African Lions and may be even the odd leopard. Return to the lodge for lunch break and prepare for afternoon 2 hour Kazinga channel boat cruise that will give you an opportunity to cruise just meters from Hundreds of enormous Hippos and African Buffalos as African Elephants linger on the shores of kazinga channel. During the boat cruise you will have a chance to spot out different species of birds hence making our Queen Elizabeth wildlife and chimpanzee safari in Uganda more experiential. Drive back to the lodge early enough for dinner and overnight at either Mweya safari lodge or Kasenyi safari Camp(Luxury option) or Park view lodge or Enganzi game lodge, Bush lodge and Ihamba safari lodge (Midrange lodges) or Lazy Camping at Bush lodge for ( Budget option) .Meal plan Breakfast, Lunch and dinner. Day 3: Queen Elizabeth Short Game drive and transfer back to Kampala. After breakfast you will check out of the Lodge rooms as we en-back on our 3 days Queen Elizabeth Wildlife and Chimpanzee Safari Uganda drive through Queen Elizabeth National Park for yet another wildlife experience by doing short a game drive before driving back to Kampala via Fort Portal with chances of viewing the Rwenzori Mountains, the beautiful banana plantations as you drive through fort portal and later drop off at your Hotel in Kampala or Entebbe international airport. Meal plan Breakfast and lunch. 2 People – US$990 Luxury or US$820 Midrange or US$650 Budget for Lodging options. 4 People – US$890 Luxury or US$665 Midrange or US$490 Budget for Lodging options. 6 People – US$810 Luxury or US$610 Midrange or US$445 Budget for Lodging options. Souvenirs and all expenses of personal.